VEG here! I thought I'd try a food experiment today because it's the holidays. I went down to the end of the Crinan Canal (1 second!). We didn't have any fish heads in the freezer so we took some bacon and some neck of venison. 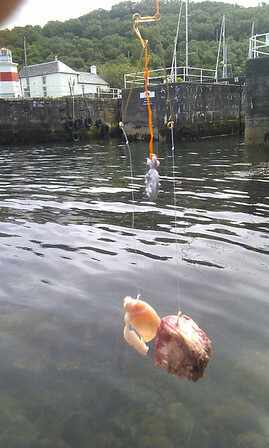 I wanted to work out what local crabs liked for their lunch so I had both baits on my crabbing line. Dad put the bait on and I lowered it in next to the wall. I caught 14 crabs and 1 fish in total. Guess which bait was brilliant and which almost failed.... I'll tell you tomorrow! Here's a photo of a school dinner you have sent in. I'm going to play the warm...warmer...hot....roasting game tomorrow with Dad to find the country it came from on the globe. I'll tell you how long it takes me and all about the food tomorrow. I feel like an animal tamer today because I rescued a bird in the conservatory and picked the fish out of the bucket of crabs. The bird let me pick it up and the crabs didn't nip me. Sorry it's a crab's dinner but we've not heard from our guests today. Why have the guest blogger didnt post aniything? I think when you have a chance like this, to post on a blog, that have 7179720 Pageviews, you should use it ! Enjoy your food, VEG ! As the blog travels we will get hiccups. Some of the time zone differences will be challenging! I bet the bacon worked the best! I went crabbing in Charleston, South Carolina once and we caught a bunch of crabs using fatback. Wow, 14 crabs! That's great! Did you eat them for your dinner? I like bacon and venison but I'm going to guess that crabs prefer bacon. Am I right? 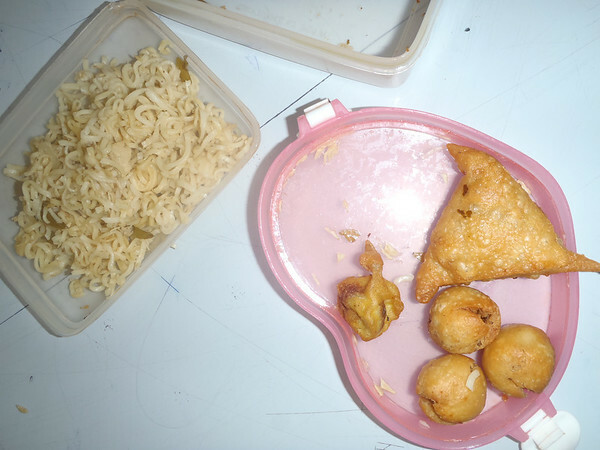 I'm not sure where the school dinner is from but the picture looks like noodles ans samosas. I'm going to guess Thailand. I'm probably miles out! Good to hear from you again, VEG! It's funny how distinctive your writing is, definitely in a good way. I have no idea which the crabs would prefer, but based on the comments, I'll be surprised if it's not bacon now! I hope you're really enjoying your holiday. I especially liked reading about your animal-whispering skills! Nothing wrong with a crab's dinner, nor being an animal tamer - enjoyed reading it and you had fun. Perhaps the dragon was a little mightier than first thought and the guest bloggers are having a bigger battle, so long as they come away unscathed, the parchment may make it through with an update of their adventure. Looks like a flat rice noodle, or maybe I need my eyes tested. Samosa - wide ranging dish across many countries. I used to go crabbing! I found they preferred squid, but I never tried them on bacon or venison! Shame about your guest blogger, but terribly nice of you to make sure all your fans got a post today. Looking forward to the answers tomorrow - can't begin to guess them! my guess is that the fish ( it looks like a shore rockling ) was caught on bacon; as greedy as they are the venison looked a bit of a mouthful for it. Thinner slices allow the crabs to grip too, so my guess is that bacon caught more. Thanks for the experiment AND a mystery on your hols! My grandmother always caught lots of crabs in her Ft. Lauderdale, Florida house's canal with chicken necks, so I will guess your crabs liked the bacon better. We loved her crab dishes! I'm going to guess the Philippines for the school meal because it has both noodles and fried things. I could be wrong, but it will be fun to find out and to read with what the fried things are stuffed! We have all missed you! It sounds like you are having a great break! I think crabs like bacon, but I am biased. I LOVE bacon!!!!! I like your experiment. Science is FUN!!!!! That food does not look appealing...quite greasy! But I'm sure it tastes good. It is sad that somebody who has been chosen to blog as a guest decides not to. Perhaps people were a little harsh on her post yesterday, but I'm sure there are hundreds of schools who would have loved to have guest blogged. 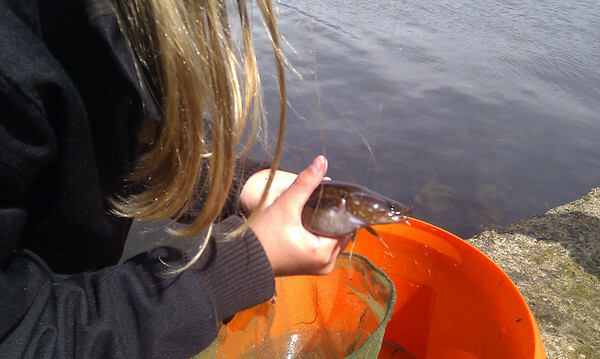 Our Year 6 children went crabbing - they found the bacon to be effective! Now this could be fun! The fish are going to start sending you pictures and critigues of the dinners you feed them. Hahaha! I agree the bacon is a better bait especially if it is cured. The salt attracts animals naturally and crabs are scavengers, right? my son is a fisherman and they catch snow crab in the North Atlantic off Cape Breton Island (How many seconds?) but they do not use bacon for bait. It costs about $6 a pound here. Keep up the animal training and we'll be calling you Dr. Doolittle soon instead of Veg. Everyone seems to still be enjoying your efforts. Great stuff. Thanks, Veg! Yes, I hope the terrible flooding hasn't impacted the guest bloggers. Their food looked great and I love hearing about other methods of education. I found it super-interesting. I hope they come back! Geez, you guys are being really harsh. Remember, these are children, and also, things come up. I appreciate your post from yesterday, girls from Hertfordshire! And go catch those fish, veg! Tho yesterday's was from Japan, I'm thinking that again, because those ball-things look an awful lot like those Japanese ball-things with octopus in them. Can't remember the name right now. We like to encourage all children to get involved and to share their daily dose of school dinners. There are many different school cultures and food cultures around the world. We don't want to put off kids and schools from taking part and if some need support to do so that's fine. I'm guessing the food is from India, vermicelli upma, samosa and bonda.